When I read a book I don't expect to make a friend but after reading Kimberly Williams .....from the Mouth of Babes I feel like I personally know her. Kimberly shares her heart while she shows how to apply scripture to our daily lives and with our kids. She has a way of taking everyday events and turning them into teaching moments we can all apply to our lives. 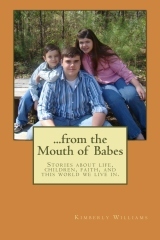 .....from the Mouth of Babes is a collection of short stories about life, children, faith, and this world we live in. The 170 pages are divided into 4 categories: Stories about Marriage and Children, Stories about Life and Spiritual Growth, Stories about the Church and our Culture, and Stories about Holidays and Special Occasions. Some of Kimberly's stories are about evolution, feminism, thanks-giving, music, silence, discipline, dying, and pajamas and they will have you thinking, crying, and laughing. The book can be purchased on Create Space or Amazon for $14.95. Kimberly Williams is a pastor's wife, homeschooling mother, author, and most importantly a disciple of Jesus Christ. Living with her husband and three precious children, her career is her family. With the loving support and encouragement from her husband and the amazing grace of God, she has been homeschooling for ten years. Each year brings new experiences, creates wonderful memories, and brings her family closer together. The Williams family realizes that homeschooling is much more than ABC's and 123's. It is about discipleship. Kimberly has contributed to various homeschooling magazines including Home School Enrichment and Homeschooling Today. Her passion for writing has one purpose, to point others to Jesus Christ. She is the author of Living Out the Word, a series of expository ladies Bible studies through the books of the Bible. In addition to writing, Kimberly also enjoys speaking to women and encouraging them in their daily walk with the Lord. She points them to God's Word and challenges them to be a true help meet to their husbands and loving mothers to their children. In her spare time, Kimberly loves to read classic literature, play the piano, and write songs and poetry. She would love to hear from you on her blog at Until the Day Dawn. I received ....from the Mouth of Babes free of charge from Kimberly Williams in exchange for my review.